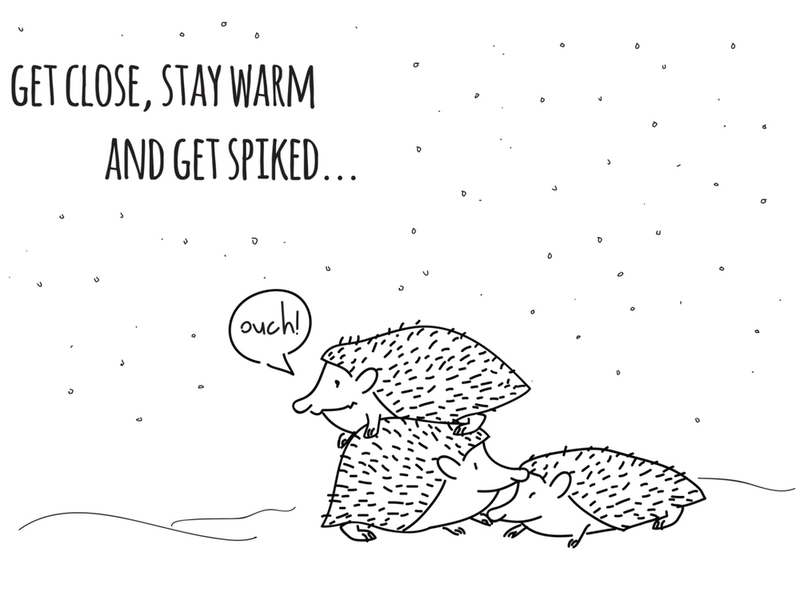 On a cold day a hedgehog will search out other hedgehogs to huddle up with to keep warm. But because of his prickles he is forced to make a choice. Get close, stay warm and get stabbed; or keep away, stay safe and freeze. In 1851 German philosopher Arthur Schopenhauer came up with the ‘Hedgehog’s Dilemma’ (I paraphrased it a little) to describe our human predicament. We long for strong and intimate relationships, yet we also fear getting hurt so we do all we can to protect ourselves. So what is the answer to ours and the hedgehog’s dilemma? Get naked. Being a naked hedgehog isn’t for everyone. It’s for those brave souls who are willing to take off their prickles and let down their defences. Do you dare to bare who you are on the inside? Are you ready to be yourself and be known and loved for who you are? I won’t pretend that authentic relating is easy – it isn’t. It takes courage and also discernment to know whom we can trust. But I do know that investing in authentic relationships is one of the most rewarding adventures we can ever undertake. Are you ready to de-prickle and experience deeper connections? Join us for the Naked Hedgehog Kick-Starter or Bootcamp.